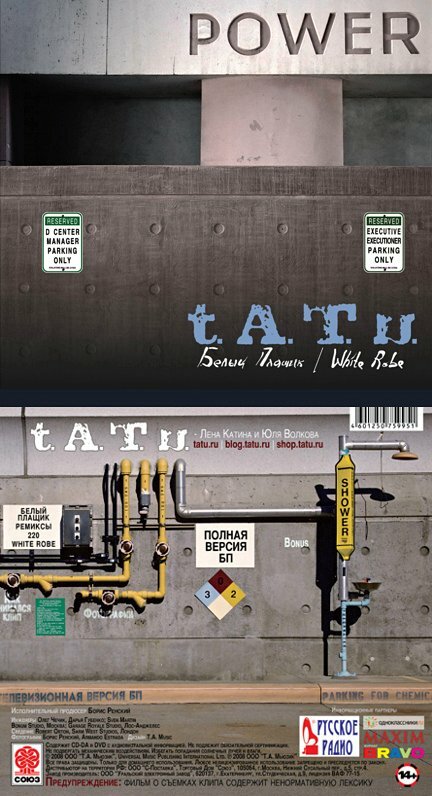 03/04/2008: "“Beliy Plaschik” maxi-single cover"
Tatu.ru released the official cover of the upcoming “Beliy Plaschik” maxi-single. It was revealed in December that the CD will contain the song, remixes, uncensored video, and possibly a karaoke version. At the moment, there is no confirmed release date of the single. Oh my god, thanks Natasha!!! It's true! Get back girls!!! awful cover but a wonderful single. I almost wet my paints just seeing all this. It's a trick. Click "no" on the image when you click the White Robe website. It brings you to the main page for White Robe. I like it, can't wait! Don't understand why it says power though... I wonder what the bonus is?